A few of my favorite [running] things. I have to wear some kind of headband, not really because of my hair but to keep the sweat from dripping down my face. For me, it’s a true sweatband! I have an unusually large head, so the headband has to be on the bigger side, and stretchy. One of my favorites is the one I got from the 50 States Half Marathon Club. It fits me just right, and I love representing the club by wearing the logo. 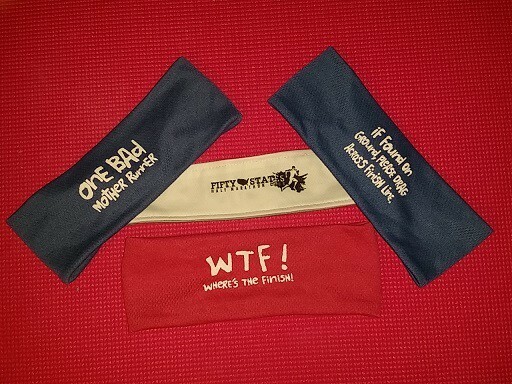 I also love the fit and feel of the headbands from One More Mile. The sayings and colors are just fun! When it’s raining, there is nothing like a hat with a brim to keep the rain out of your eyes. Unfortunately, again due to the size of my head, I can’t wear a lot of hats. 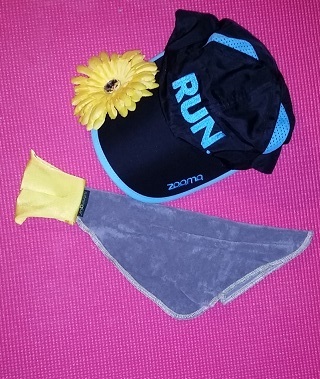 As luck would have it, the hat I received at the ZOOMA Cape Cod half marathon fits, and I love it! A newer accessory for me is my Fellow Flower. I have one, and I gave one to each of my sisters. Each flower has its own story. The clip is extremely strong; it has never slipped on any of my runs. It’s just a fun accessory with an important meaning. I don’t have one favorite brand of race shirt. It of course has to be the right material, but the most important to me is the cut. FILA makes a nice race shirt, and it’s long which is something I need. My feet – the bane of my running! Easily injured so I really try to pamper them when I’m running. 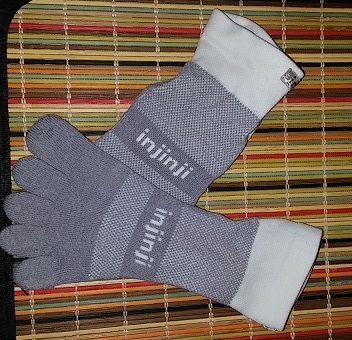 Out of the blue this spring I started getting blisters between my toes and was overjoyed to find Injinji toe socks. I buy the thickest socks they sell and have not had a blister since! For running shoes, I like a lot of cushion (these feet!). I was enjoying the Hoka Cliftons until my podiatrist said I really need some support. Both he and my sports medicine doctor recommend Brooks, so I purchased some Brooks Glycerin. I love them! They are very cushioned and have enough support for me. Hopefully they won’t be changed in future models (I hate when that happens!). The only problem is that I wear wide width, and there are no fun colors in wide width. 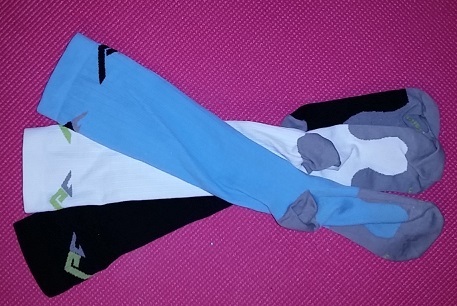 After a long run I like to slip into some nice Pro Compression socks. Keeps the post-run aches and pains under control! 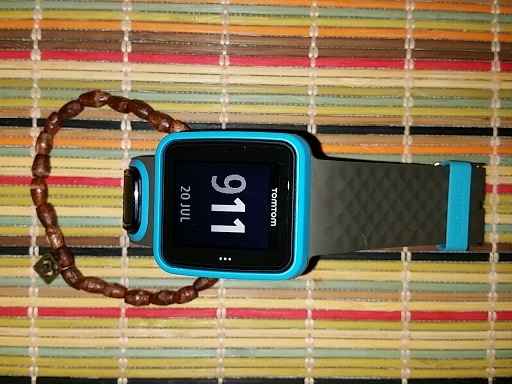 Accessories – I couldn’t run without my Amazon app music or Scribd app books. 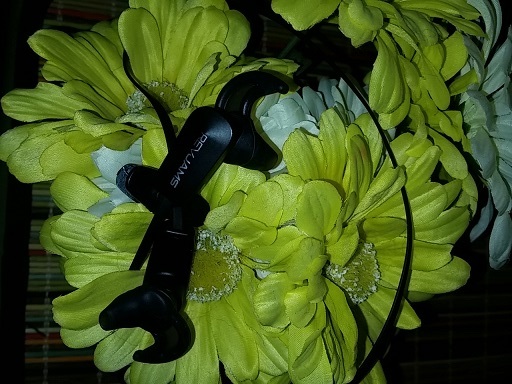 A few weeks ago I got my first pair of bluetooth headphones – heaven! Not having that cord run down my shirt and not accidentally ripping the buds out of my ears makes for a much more comfy run. These were very inexpensive. They may not be the best sound quality, but I can’t tell good quality sound from bad quality sound. I use Runkeeper for my run tracking app. 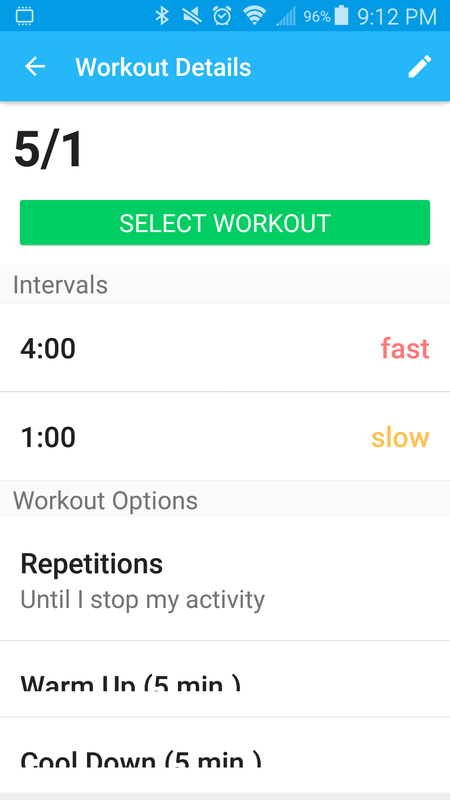 The best feature I have found is that I can set intervals “until my activity is completed.” That way, no matter the distance of the race, the intervals keep going. I haven’t seen that on too many other apps. I have just started using a Tom Tom running watch. I love the large numbers and it seems to be tracking distance similar to Runkeeper. It’s a good backup in case Runkeeper shuts down. I think I already mentioned I really sweat, and I also have some outdoor allergies that cause my nose to run almost immediately when I step out the door. I used to carry a small towel but it was so inconvenient and made my hand sweat. I was thrilled to find Runningluv! I wrap it around my wrist and it’s like having a wristband and towel in one. True luv! Where has Buddy Pouch been all my life? Carrying my phone in a pouch attached by magnets is so convenient. I hated when my belt would ride up, and I don’t like arm bands or to put such bulky things in pockets. This is the perfect solution. 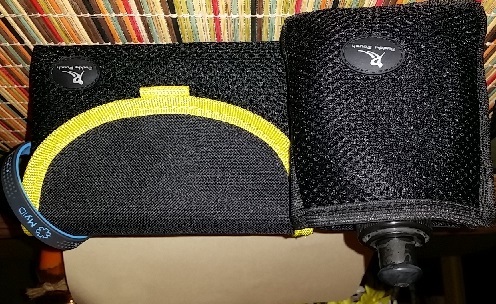 The pouch doesn’t move, it doesn’t pull down my skirt (I’m sure my fellow runners appreciate that), and after a few seconds I forget it is there. It is also easy to take my large phone out, something I struggled with using other belts. It also has an expanding pocket for other stuff. Buddy Pouch also has a water pouch. I don’t drink too much on my run, so it is a perfect size for me. 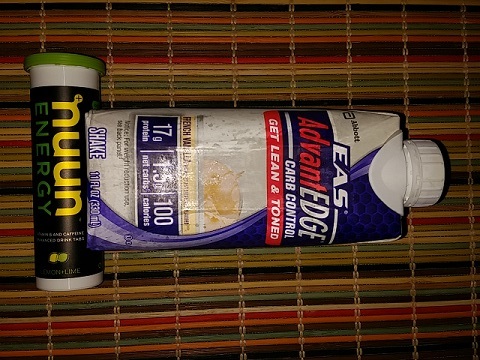 Speaking of hydration, I just started using Nuun before and/or after my runs. Too soon to tell if it makes any difference, but it tastes pretty good and I do feel like I might be a little more energetic. One thing I do like after my run is EAS Advantage. I know it’s not the best protein drink, but it tastes good and doesn’t have a ton of calories. I’m always running with my Trust Your Journey bracelet. I have one, and I gave one to each of my sisters and daughters. It is very meaningful to me, and when I am struggling during a run I look at my bracelet and tell myself to trust my journey. 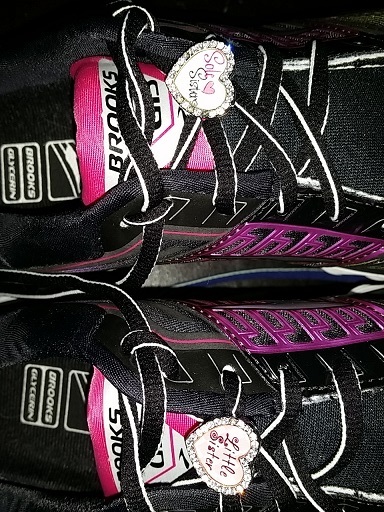 My sister gave me and my other sister these Beecause charms, and I think they add some nice bling to my running shoes They have special meaning and remind me of my sisters when I am running. So there you have it, a few of my favorite [running] things. Give one, or all, of them a try, and let me know what you think!